I know it has been a long time since my last post. I’ve been travelling a lot between USA, AbuDhabi, Dubai and Lebanon to see my children. Today I am back with this recipe of rolled Man’oushe, which melts in the mouth because the dough is so soft. I hope you will like it as much as I enjoyed preparing for my loved ones. – Place each roll in cup cake tray and let it rest for about half an hour. 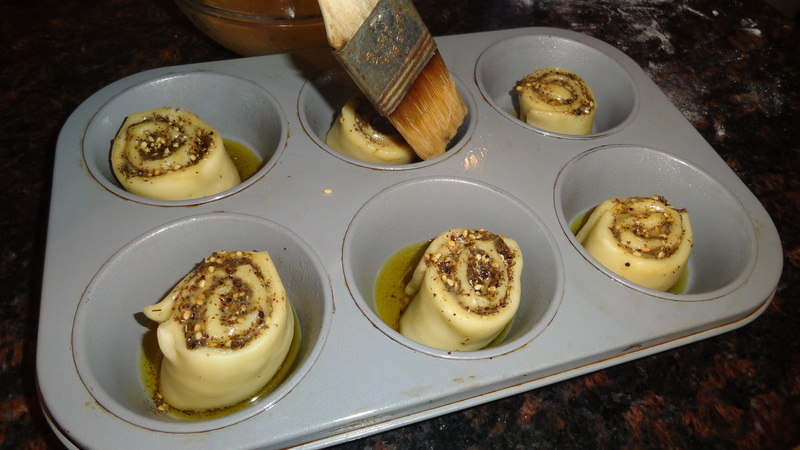 – Cook for 20 minutes, or until the top of the roll becomes golden color. I have missed you and worried about you!!! So happy to see you back and know you are okay! Thank you so much… I have missed you guys as well…It is good to be back..
Hello! Do you put the instant yeast in the dough without letting it rise in water…? One of the best zaatar recipes ever! It’s hard to get enough of them. Thank you so much for the recipe! Just one question…is 190 degrees in celcius? So if I convert it to farenheit its 375.